Quilt blocks can be simple squares of fabric, or they can be very complex. Intricate quilt block designs can be made with fabric scraps cut into curves, small triangles and squares, circle halves and shapes like leaves, petals or figures. Blocks made with intricate pieces of fabric require more handling, which means that fraying is more likely than with a simple square. 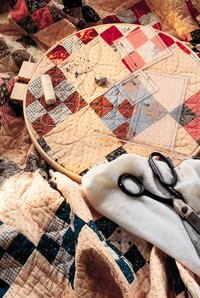 A few simple techniques will help you prevent or minimize fraying when you make quilt blocks. Quilters generally wash fabric before cutting it into pieces to use in making quilt blocks. Prewashing fabric lets you know whether the fabric will shrink or the colors will run. However, it also removes the sizing which helps to prevent fraying. When washing a length of fabric for quilting, serge or sew the cut edges of the fabric with a zigzag stitch to prevent fraying in the washing machine. If you have to wash a quilt block, wash it by hand and avoid wringing or twisting the fabric. If you have to wash a lot of quilt squares, stitch around the edges with serging or the zigzag stitch on your machine before washing. Let the blocks soak, and skip the agitation part of the washing cycle. Spray each quilt block with spray starch or sizing when you iron it, especially around the edges, to prevent fraying. To avoid a buildup of starch on the quilt block, make your own spray starch by dissolving starch in water to make a thin solution or add water to a liquid starch solution. Store it in a plastic spray bottle for use when you need it. Cut your quilt pieces with a pinking rotary cutter or with pinking shears. If you have already cut them out and they are starting to fray, carefully trim the fraying edges with pinking shears. Because pinking shears or the rotary cutter with a pinking wheel cut a zigzag edge along the edge of the fabric, any thread that frays will be short and won't cause fraying along the rest of the edge. If you have to handle quilt blocks a lot -- for instance, sewing a lot of small pieces together to make the block or appliqueing fabric onto the finished block -- protect the edges with narrow painter's tape folded over the edges. It's worth the extra effort required to run pieces of tape around the block to prevent the block from fraying and possibly shredding through the seam allowance into the body of the quilt block. Sew a Quilt: Prevent Fraying Fabric?